California bill SB 705 aims to eliminate plastic foam food and beverage containers at restaurants and other food service providers statewide in California. Expanded polystyrene (EPS) foam, aka Styrofoam, from restaurant packaging items is one of the top items collected at beach cleanups throughout California. Up to 80% of ocean pollution is trash from land-based sources, including non-recyclable food packaging. Polystyrene plastic and other single-use food packaging have a tendency to be littered, since it's typically used away from home. It may become litter even when thrown in a trashcan because it's so lightweight and can easily blow out of cans or garbage trucks. The Ocean Protection Council estimates that the current cost of cleaning up marine debris annually may well push the $1 billion mark. Recycling opportunities for polystyrene and most other plastic take-out food packaging are limited, and no widespread recycling scheme for polystyrene has ever been successfully implemented. Rather than continuing to clean up these products, which don't biodegrade in our lifetimes, we are seeking to eliminate this pollutant at the source. We encourage better alternatives like reusable choices whenever possible! SB 705 is currently weaving through Senate committees and will likely be up for a full floor vote in the near future. Please call your California Senator in support of SB 705, and share this action alert now! Here's a script to use on your call, but feel free to make it personal! Look to the bottom of this script for your Senator's number, and let us know how it went! I'm calling today to urge your support of Senate Bill 705, which would phase out Styrofoam from food packaging statewide for restaurants and other food providers. Styrofoam, also known also known as expanded polystyrene foam, is bad for our ocean and wildlife. It also leads to costly clean up efforts and cannot be easily recycled. Without state action to address the problem of takeout food packaging litter and waste, local agencies have been left to enact a patchwork of local restrictions. Approximately 100 cities and counties have already banned food vendors' use of expanded polystyrene food packaging, showing that it is viable statewide. Let's finish the job! 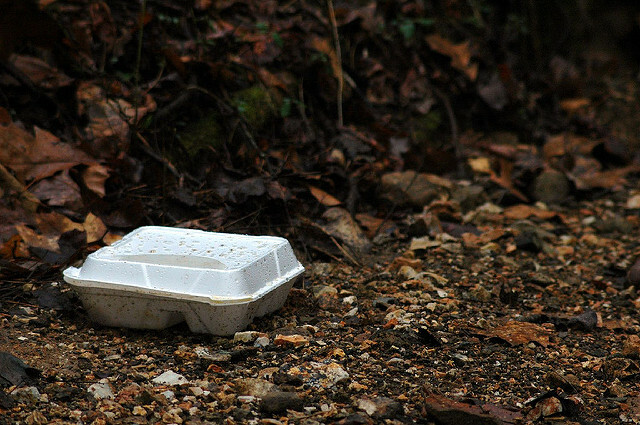 It's time for the state to act and ban polystyrene takeout food packaging. For these reasons, I urge your support of SB 705.